LAST WEEK, FORMER Anglo Irish Bank chief executive David Drumm was granted free legal aid for his defence against two charges of conspiracy to defraud depositors and investors in the now-defunct bank. Since quitting as the bank’s CEO in December 2008, Drumm lived almost exclusively in the US where a lengthy attempt to declare bankruptcy was denied before he eventually returned to Ireland last year. At the time Drumm left Anglo he was on a salary of about €3.3 million, not counting his pension entitlements. Still he was granted free legal representation for a trial that is likely to cost hundreds of thousands of euro. In fact, in more than 70% of criminal cases in Ireland, free legal aid is granted by the courts. Why is this? TheJournal.ie took a closer look. 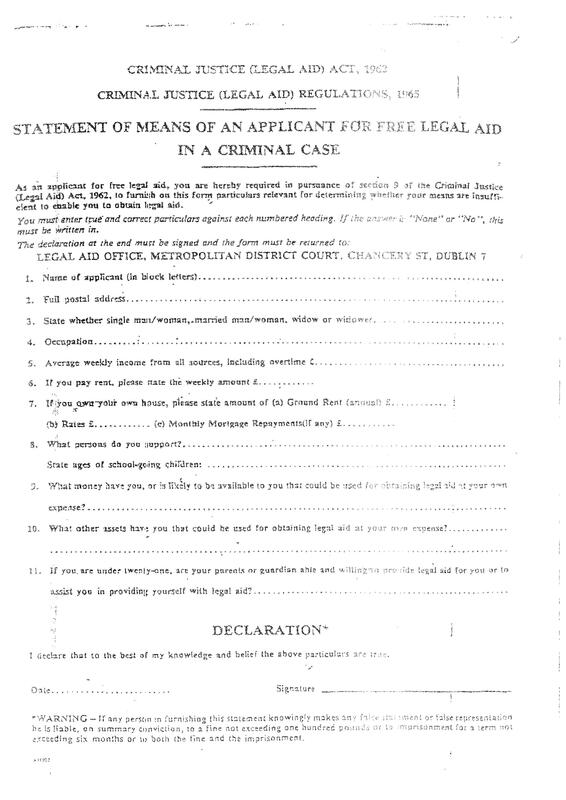 Legal aid applies in both civil and criminal cases in Ireland, though in quite different ways. Civil law applies to disputes between parties (a defamation action, or an argument over lottery winnings say), while criminal law relates to the State prosecuting those accused of a crime. Civil legal aid however is restricted in the kind of cases in which it can be used – property disputes, defamation, or non-court tribunals (like social welfare appeals or the workplace relations commission), are all excluded. In all other cases in which it does apply, the aid provided is rarely 100% ‘free’ – the representation given to an individual is on condition that the person in question satisfies two means-test requirements and that a monetary ‘contribution’ is made to the system in return. The threshold for the first means test is that an individual have a ‘disposable’ income of less than €18,000 per year (not counting certain allowances such as €8,000 for accommodation and €6,000 for childcare, also per annum), and assets worth less than €100,000 (not counting the family home). “That can be complicated by the fact someone may own machinery or land for example that is essential to their livelihood – farmers for instance,” says Ciarán Finlay, legal and policy officer with Free Legal Advice Centres (FLAC), a charity providing free advice to those who can’t afford it. The second requirement is a ‘merits’ test – an individual has to show that were they able to afford it they would still pursue their case to the courts, and that professional legal opinion would advise them to do so. The Legal Aid Board (LAB) meanwhile is the statutory instrument responsible for legal civil aid. Applications for such aid can be made at any of the LAB’s offices nationwide. The majority of the board’s operating capital is provided by a grant from the Department of Justice (just under €33 million in 2015 – by contrast €1.5 million was received in contributions from those receiving aid in the same year), while solicitors working for it are paid at civil service rates (the most recent annual report for the board detailing where its money is spent can be found here). “It’s €30 for receiving advice, and €130 (recently increased from €50) is the minimum contribution for the duration of a legal action, that’s assuming you have income of less than €11,500 per year,” says Finlay of the mandatory contributions. Often people will have to pay a four-figure sum in reality. But it really depends on where you fall on the scale. FLAC is a charity providing advice (generally at a maximum of 15-to-20 minute sessions given the demand) for those who cannot afford to pay for it, provided by volunteering solicitors (there are over 320 such active volunteers in Dublin alone). The LAB meanwhile provides the actual legal representation. In some cases, certain private practitioners are paid a specific amount to cover types of cases with long waiting lists – Abhaile, the mortgage arrears resolution service, is an example of such a scheme. Otherwise, the vast majority of civil cases covered by legal aid belong to one category – family law. Fundamentally, if you find yourself involved in a domestic dispute and you cannot afford to pay for it, the State will make sure you have representation. And those defending you are expected, in theory, to work as hard for you as they would in a case in which the State had no involvement. Which brings us to criminal legal aid, the kind that David Drumm is to receive. Such aid is completely free, and it’s a costly business for the State – in the three-and-a-half years between 2010 and July 2013 the Irish government paid out €188 million in legal fees. That money comes directly from the Department of Justice – there is no equivalent of the Legal Aid Board for criminal cases at present. There is also an ad hoc scheme relating to Criminal Assets Bureau matters, and the custody issues scheme, relating to issues of a person’s liberty such as in extradition proceedings. These two schemes are the only ones relating to criminal matters to be administered by the LAB. In February 2015 Fair Trials International found that in Ireland 71% of suspects and accused persons are entitled to legal aid. By contrast, the figures for Slovenia and Hungary are 2% and 0.1% respectively. The Fair Trials report, while noting the obvious differences in respect of a country’s economic output, cost of living, and average salaries, nevertheless said it is “critical that anyone who cannot afford to pay for legal representation meets the eligibility threshold in circumstances where it would be unjust for them to face criminal proceedings without such representation”. For criminal legal aid here, a means test does apply – the accused must hand in a detailed one-page statement of assets and means, including their family situation, maintenance payments etc. At the bottom of the legal aid form an applicant signs a declaration acknowledging that they could face a fine and six months in prison for knowingly completing the form inaccurately. In the case of David Drumm, four barristers and a solicitor will be required for his defence, and they have to be paid for. The judge in his case noted also that he is ‘an undischarged bankrupt’, while the prosecution in his case admitted that his assets are ‘roughly what one would expect them to be’. Crucially, the office of the Director of Public Prosecutions did not object to aid for Drumm – its chief concern is that the matter go to trial as soon as possible. An application for criminal aid is normally made to a judge in person at district court (or special criminal court) level in Ireland – it must then be reapplied for as the case rises through the judicial levels. “Usually it’s weighed up – what is the likelihood of facing a custodial sentence, your means, the seriousness of the allegations,” a legal source familiar with criminal defence cases told TheJournal.ie. There are two categories of client – there are those of low-income households, or people on social welfare, and the gardaí normally won’t challenge a legal aid application in such circumstances. In all other cases, it’s tested in terms of the seriousness of the case, the likely sentence should the defendant be convicted, and the likely cost of a defence. So to defend a criminal case – you’re talking about retaining solicitors, sometimes also a junior counsel (a barrister), and for the more serious cases also a senior counsel. Significant work goes into preparing a case including retaining expert reports, and it can get very expensive very quickly. So is absolutely free legal aid for criminal cases fair? The answer, like so many things in life, is a matter of perspective. At present, criminal aid is governed by the Criminal Justice Act 1962. Last September Minister for Justice Frances Fitzgerald committed to one of her party’s pre-election promises – the moving of criminal aid to the aegis of the LAB, and the introduction of measures to safeguard against abuses of the system. Those measures include the introduction of contributions from defendants (similar to those seen in civil cases as mentioned above), more rigorous means testing, and heavier sanctions for abuses of the system. Despite this, Ireland’s legal aid system is seen as being one of Europe’s better ones. At present a directive on the subject is expected imminently from the EU – one that is in all likelihood aimed at raising other countries (such as the aforementioned Slovenia and Hungary, not to mention Italy) to the same levels of aid as Ireland currently boasts. “It is a good system, although, and it would not be popular to say this, the payment for solicitors and counsels can be low for the pressure and volume of work involved,” our legal source says of the Irish system. You could prepare a case for months, or even years – analysing the evidence, doing research and obtaining expert reports, and if your client leaves you before trial or if the State withdraws the case, you are usually paid nothing. Having said that, most criminal defence practitioners have a mixed public and private practice (such legal professionals have to be accepted to official panels before they can be accepted for public representation), and, ideally, “work just as hard in both cases”. You can’t forget how important it is for someone to have legal representation – your liberty, your good name, employment, family rights – it’s all at stake. It’s quite easy for the general public to feel outraged, but until you’ve stood in the shoes of an accused person, you can’t really understand. “It comes down to the fact that presumption of innocence and equality underpins our democracy,” they added. With a criminal sanction such as imprisonment you essentially have the State exercising its greatest power against a citizen – depriving an individual of liberty and inflicting all the hardships that go with that. That cannot be done lightly. “Legal aid addresses the inequality between the vast resources of the State and the vulnerable position an individual is in when prosecuted – it strives to guarantee due process. Most importantly – it gives actual meaning to the presumption of innocence. And that’s a cornerstone of democracy. Email “'Until you've stood in those shoes, you can't understand' - how free legal aid works in Ireland”. Feedback on “'Until you've stood in those shoes, you can't understand' - how free legal aid works in Ireland”.